Learn how to make cabbage salad recipes; there are many versions both hot and cold or with many other vegetables included besides the cabbage. Head cabbages are available in red, greed and the Savoy varieties or what we call Brussels sprouts, miniature heads. Broccoli and cauliflower are also included in the cabbage family and make good salads as well. Most of the cabbage family are available year round. When learning how to make cabbage salad recipes look for round heads with tightly curled leaves. Although not in the fresh state, another form of cabbage is fermented sauerkraut. Sauerkraut is used in many deliciously flavored salad recipes. Cabbage has always been an important vegetable for my family; even my German ancestors. Although the Danish are credited with learning how to make cabbage recipes originally, we have always had them in many forms. Centuries ago, in Germany as well as other European countries, cabbage was thought to be the poor man’s food or “food of the peasants”. Cabbage is high in Vitamin C and other nutrients; also very low in calories. It is the other ingredients which we might add to cabbage salad recipes that will add calories. These salads can be very healthy if using good oils and vinegars with spices to season; avoiding the heavy fats. If you are not watching your calories, ingredients like mayonnaise, sour cream and cheeses do make some very good salads. The most important tip I can offer when making cabbage salads is to shred the cabbage fine. Because of the coarseness of the cabbage, the flavor penetrates better if the cabbages are cut very thin. Arrange layers of cabbage, celery, carrot and onion slices in a large bowl. Sprinkle top with the cup of sugar. Heat to a boil the vinegar, oil, salt and pepper. Pour hot mixture over the vegetables. Cover and let stand for at least 5 hours. Toss before serving. I love a good sauerkraut salad recipe! It comes from cabbage so I consider it a salad of cabbage. Anyway, try this one. it has so much flavor! 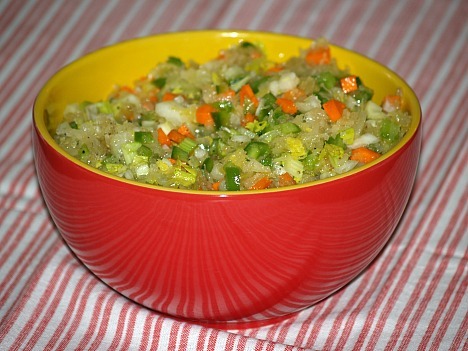 Combine well drained kraut, green peppers, celery, onions and carrots. Combine the sugar, vinegar and oil; whish until well blended. Pour over the vegetable mixture and toss to coat. Refrigerate for several hours for flavor to blend. Layer, cabbage, celery and onions in a large bowl; Cover with sugar. Blend together in saucepan the vinegar, salt and mustard; heat to a boil. Add salad oil and bring to boiling point again; pour over cabbage mixture. Cover and let stand about 4 hours; toss to blend. Combine all salad ingredients; mix well. Pour dressing over salad and toss to coat; serve immediately. Cabbage recipes sometimes go by the name “coleslaw”. This comes from the Dutch term “koolsalade” meaning cabbage salad. Combine and toss cabbage and grapes together; cover and chill. Combine orange juice and water in a small saucepan; blend in cornstarch, mustard and salt. Cook mixture while stirring over medium heat until mixture boils. Stir small amount of hot mixture quickly into beaten egg; return egg mixture to pan. Add hot pepper sauce to pan. Cook over medium heat stirring until dressing thickens; remove from heat and blend in lemon juice. Allow to cool, cover and refrigerate until serving time. Before serving blend sour cream into dressing; toss lightly with cabbage grape mixture.